Clean, smooth acceleration happens when all components of the carburetor are clean and tuned properly. The right sized jets, needle positions, and float settings will ensure there is no fumbling or flat spots from idle all the way to wide open throttle. If your motorcycle engine doesn’t seem to be running correctly, it’s probably either too rich or too lean. Some general symptoms of rich or lean running conditions are listed below. Rich or lean running conditions can be caused by any number of things, so you’ll need to first clean, sync, set and balance your carbs before making too many changes. Dull and intermittent engine noise. Performance worsens when the choke is on. Performance worsens as the engine gets hot. Removing the air cleaner improves the performance. Exhaust fumes are heavy and black. Spark plugs are black, dry, and sooty. The engine runs better when it’s cold. Throttle needs to be opened continuously to accelerate. Performance improves with the choke on. Acceleration is poor or stumbling. Engine doesn’t respond when the throttle is snapped open. Engine speeds up when throttle is closed. There is a lack of engine power, RPMs fluctuate. The spark plugs are white or burned. Popping through the carb when the throttle is opened. Popping through the exhaust on acceleration. The engine runs better in warm weather. Performance gets worse with the air filter removed. Accelerate and shift through all gears at the proper RPM. A properly tuned and carbureted engine will accelerate smoothly and quickly through the gears. If the main jet is too rich, acceleration will feel slow or stuttery. Close the throttle from full to about ⅞ open when RPMs are over 4500. If the engine accelerates, the main jet is too lean. If the engine hesitates or misses, the main jet is too rich. If the engine only slows slightly, the main jet is pretty good. You can also try accelerating through the gears at full throttle. An engine that backfires, misses, or dies has a main jet that’s too lean – try a larger jet size. If acceleration is sluggish, sounds flat, or is unresponsive to throttle, the main jet is too rich – try a smaller jet size. To test for lean or rich conditions at any throttle position, you can cover/restrict or remove the airbox. If you cover the air box and running conditions improve, the carbs are too lean. If you remove the air filter and the engine improves, the mixture is too rich. If you can turn your fuel petcock completely off so that fuel does not refill the float bowls, you can also check for lean/rich conditions. Turn off the fuel and ride the bike. If it starts to run worse as the float bowls drain, it is too lean. If running conditions improve, it is too rich. See below for how to check your fuel levels with the clear tube method. If you’re tuning your carbs while the bike is stationary, remember to get the motorcycle up to operating temperature before making adjustments and set up a box fan to help keep the engine cool. You can temporarily affect the fuel/air mixture and motorcycle performance on the fly by using hotter or colder spark plugs. Use a colder plug to lean it out, a hotter plug to richen it. If you remember what throttle position each component of the carb control, you can begin to make some adjustments depending on the running conditions you experience. Turn the air screw in to richen the mixture. Back the air screw out to lean the mixture. If your airscrew is on airbox side of carb, turning out will lean mixture. If airscrew is on engine side of carb, it will richen it. Raise the needle jet clip to lean the mixture. Lower the needle jet clip position to richen the mixture. Use a larger main jet to richen the mixture. Use a smaller main jet to lean it out. High air temperature, high altitude, and high humidity conditions require a leaner mixture. Low air temperature, low altitude, and low humidity conditions require a richer mixture. Carb floats control the fuel level in the carb bowls. The motorcycle shop manual will specify the correct fuel level for your bike. The best way to measure the fuel level is with the clear tube method. If your fuel level is too low, you might be running lean. If it’s too high, you might be running rich and fouling your oil with gas. 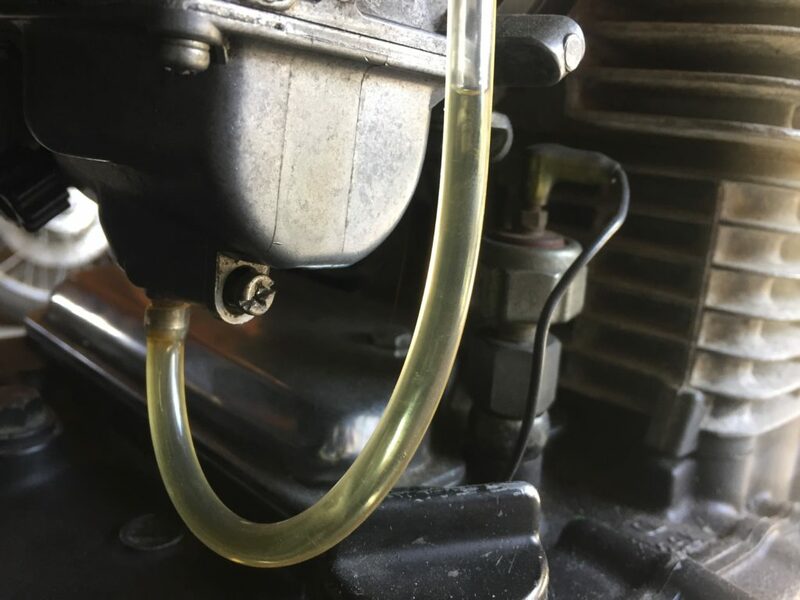 Connect a clear hose to the overflow/drain hole in the carb bowl. Make sure the carbs are level. Hold the hose up against the carb bowl and check the fuel level. To adjust the fuel level, you’ll need to unscrew the float bowl, remove the floats, and bend the tangs on the carb floats. Make small and careful adjustments and remeasure. If you plan on changing things on your engine – like the exhaust or air filter, you’ll likely need to test out new jet combinations to get your carbs running correctly. The best way to see if your mixture is correct at certain throttle positions is to do a plug chop. You’ll essentially ride the bike at the throttle position you want to test, stop the bike, and look at the spark plugs to decide whether it’s too rich or lean. Take a look at the charts that show which jets control which throttle positions and tune from there. You’ll want to get the bike up to operating temperature when you tune your carbs, as a cold engine does not vaporize gas as well and will require a richer mixture to get going. 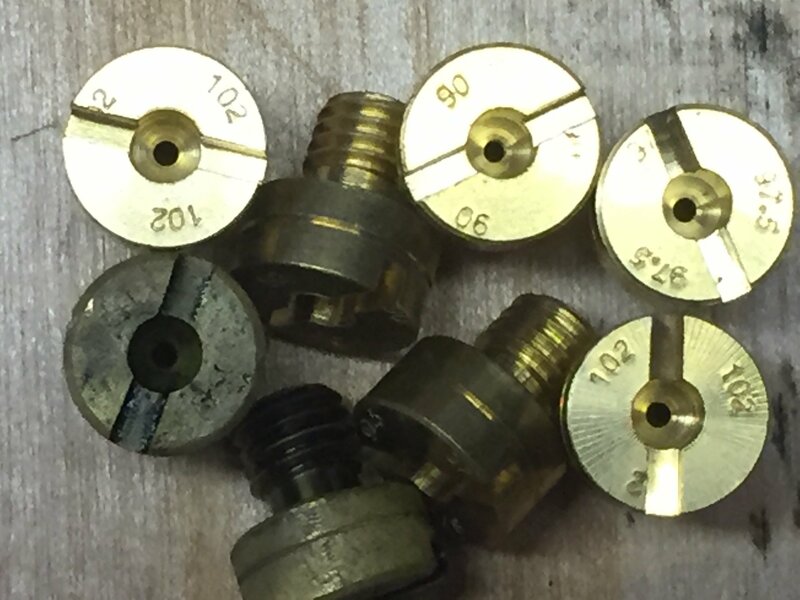 To decide if you need re-jet your carbs, you should start with a plug chop. With any good controlled experiment, it’s a good idea to change one thing at a time and retest to get it perfect. A plug chop will help you tune your carbs if you’ve changed things like the exhaust or air filter, or even top end components. Put fresh, new spark plugs in the engine. Bring the motorcycle to operating temperature. Find a flat, long, empty road. Ride for about a mile at the throttle position you want to test. Pull in the clutch, kill the ignition and throttle, and coast to a stop. Remove the spark plug and inspect the color and note the engine’s performance. Below are some general guidelines for changing jets when you make changes on your bike. This guide serves as a general procedure for deciding which jets to try when changing from stock. Add 2 main jet sizes for a 4 into 2 exhaust. Add 4 main jet sizes for a 4 into 1 exhaust. Add 4 main jet sizes for open headers. Add 2 main jet sizes for a single K & N air filter inside a stock airbox. Add 2 main jet sizes if modifying a stock airbox with holes. Add 4 main jet sizes for pod filters. Subtract 2 main jet sizes. Subtract 2 main jet sizes for every 2,000 feet above sea level. Add 1 pilot jet size for every 3 main jet size increases. Subract 1 pilot jet size for every 6,000 fet above sea level. Remember, these are just general starting points. Every time you make a change you’ll need to re-sync, check your plugs, and observe how the bike operates at different throttle positions.